Posted on Thu, Apr 15, 2010 : 6:26 p.m.
Michigan football coach Rich Rodriguez said Thursday on WTKA-AM (1050) that quarterback Tate Forcier might not play in Saturday's spring football game because of "a minor foot sprain." Forcier suffered the injury at the end of practice Tuesday and was spotted in a walking boot on campus Wednesday. He practiced on a limited basis Thursday. "There’s probably a lot more drama out there than there really is. That sometimes happens," Rodriguez said. "I don’t know if he’s going to be able to go and take any reps during the spring game or not but he’s had a pretty solid spring." If Forcier can't play, Denard Robinson and Devin Gardner will take the majority of snaps. Robinson has been pushing Forcier for the starting job this spring. 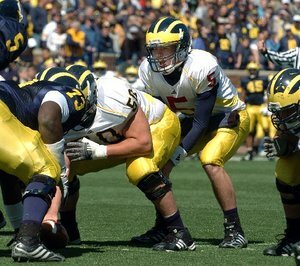 Dave Birkett covers University of Michigan football for AnnArbor.com. He can be reached by phone at 734-623-2552 or by e-mail at davidbirkett@annarbor.com. Follow him on Twitter @davebirkett. Fri, Apr 16, 2010 : 2:30 p.m.
Terry Star21, I really do enjoy your optimism and humor. That hope each of us has for our team is the thing that makes college football so much fun. Fri, Apr 16, 2010 : 11:41 a.m. Sorry Theo, I don't believe in the "King", but I'm still all Michigan. Fri, Apr 16, 2010 : 10:37 a.m.
Agree with Theo, our king has the best quarterback our school has seen since before Carr, heck even maybe Yost... love to see him play this week, won't be the end of the world if not... nice recovery for next 3 months... Tate will be mentioned with Mallett for sure as Heisman, make a much better selection than tebow did as a sophmore. Fri, Apr 16, 2010 : 10:14 a.m.
Fri, Apr 16, 2010 : 9:15 a.m.
Fri, Apr 16, 2010 : 7:30 a.m.
same as last year. this kid isn't built to be a qb at a bigten school. this doesn't sound like anything serious...but it seems to be following his trend from last year. he won't make it through the season uninjured. Fri, Apr 16, 2010 : 6:52 a.m. Okay boys and girls here's my take. If Tate has a bum foot don't play. If Tate's foot is one hundred percent, play. Thu, Apr 15, 2010 : 9:24 p.m. Initially I was bummed but this may be a good thing.